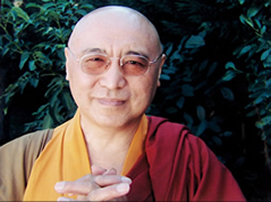 Tulku Pema Wangyal Rinpoche, (Tib. པདྨ་དབང་རྒྱལ་རིན་པོ་ཆེ།)or Taklung Tsetrul Pema Wangyal Rinpoche (b.1945), is the first son of the Dzogchen master Kangyur Rinpoche. He is the main resident master of the three year Nyingmapa retreats in Dordogne, France, director of the Association du Centre d'Etudes de Chanteloube and founder of the Padmakara Translation Group. This page was last edited on 19 May 2014, at 13:39.